The dictionary defines the word “crisis” as “a time of intense difficulty, trouble, or danger,” but its etymological root is the Greek verb kritein, meaning “to judge” or “to discern.” A moment of crisis will provoke heated discussion and demands for change, but a genuinely fruitful response requires discernment: a serious judgment, that is, a thoughtful effort to get to the root of the problem, and a recollection of the fundamental truths on the basis of which to engage it. 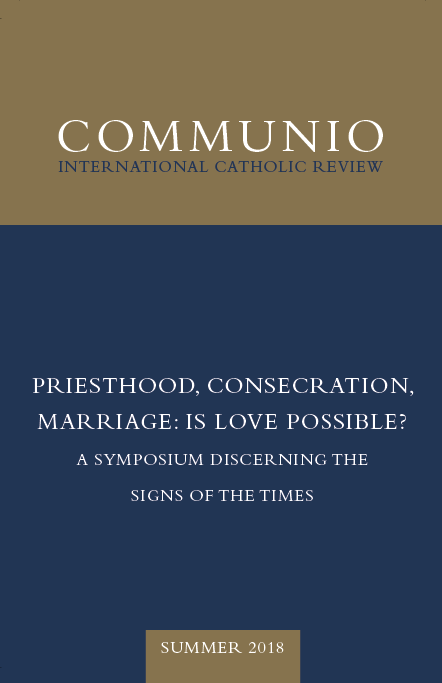 This issue presents the papers prepared for the Fall 2018 symposium convened by the John Paul II Institute to discuss the essential realities of the faith at stake in the crisis that now faces the Church. It meditates on and examines the office of priesthood and the vowed states of life—consecration and marriage—in light of our current disenchantment with them. Is it possible now, with what the crises have exposed of human frailty and the tendency to corruption, to live these fundamental vocations in fidelity and truthfulness? As we seek to discern the signs of the times, how can the suffering of the Church guide us to repentance, clarity, and a new birth? In “The Contribution of St. John Paul II to the Integral Human Formation of Priests,” Carter Griffin demonstrates the desperate need for better human formation of our seminarians, since it is the “priest’s very humanity that Christ will use as ‘an instrument of salvation.’” A full and generous humanity, so exemplified by John Paul II, is a “decisive contributor” to the fruitfulness of a priest. Through a fuller and more human formation, our seminarians and priests will be prepared to respond to the crises of chastity, charity, and fatherhood in the Church and the wider culture. In Retrieving the Tradition, we take the occasion of the reflections on priesthood as a total gift of self to present the first-ever English translation of Maurice Blondel’s famous “Letter to Fr. Bieil: The Discernment of a Philosophical Vocation.” As Emmanuel Tourpe, the editor of the new French edition, explains in his “Critical Introduction to Blondel’s ‘Letter to Fr. Bieil,’” Blondel wrote the letter to help illuminate his discernment of the possibility of a vocation to the priesthood. The letter thus offers an insight both into the meaning of the ideal of priesthood, and also into Blondel’s own conception of his mission as a Catholic philosopher.